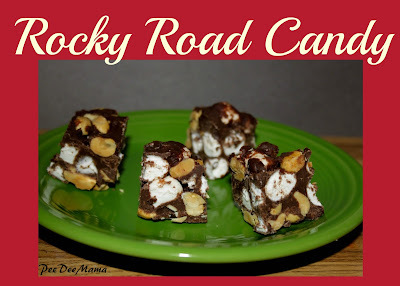 Rocky Road Candy is a favorite Christmas treat for my family. My mom used to make this every Christmas, and now both my brother and I make sure that our families have it each year as well. Line a 13x9" pan with waxed paper. Melt chocolate chips with condensed milk and butter in microwave. In a large bowl, combine nuts and marshmallows. Fold in chocolate mixture. Spread in pan. Chill overnight. Remove from pan, peel off waxed paper, and cut into squares. Cover and store in refrigerator.